Hewlett-Packard reported results for the last quarter of its fiscal year on Tuesday, and although sales were down from a year earlier there were some much-needed signs of improvement. Overall, HP's revenue for the quarter ended Oct. 31 was US$29.1 billion, the company said, down 3 percent from a year earlier but better than the $27.9 billion expected by financial analysts polled by Thomson Reuters. Net income was $1.4 billion, compared to a loss of $8.9 billion in the same quarter last year, when HP recorded a huge impairment charge for its acquisition of UK software firm Autonomy. Excluding one-time items, HP reported earnings per share for the quarter of $1.01, down 13 percent from last year but again better than analysts had forecast. The results gave a boost to HP's stock. Its shares were trading 6 percent higher in after-hours trading Tuesday, at $26.51. HP's enterprise group reported a 2 percent increase in revenue, helped by increased sales of x86 servers and network gear, HP said. The growth came at a price, however. HP's x86 growth came partly from one big sale of "hyperscale" servers, which tend to yield less profit, and that contributed to a lower profit margin for the enterprise division as a whole. Revenue from HP's Personal Systems group dropped 2 percent. Consumer PC sales continued to decline, but its commercial business picked up by 4 percent, the company said. Pricing pressure lowered profit margins in the PC division as well, however, and PC sales were lifted by a single large deal in India. That will make it hard for the PC group to repeat the strong performance next quarter, and HP expects the division to report a bigger decline next quarter than it did this quarter, said CFO Cathie Lesjak. 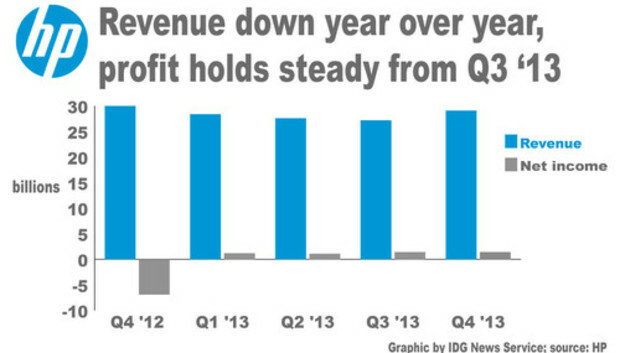 HP's printing, software and enterprise services divisions all reported declining sales. But HP was happy with the printing division because it yielded higher profits, helping to offset the decline from servers and PCs, Lesjak said. It's been a tough year for HP. The PC market has been in collapse and its enterprise business has been floundering under what Whitman has called poor execution. At one point, Whitman had said HP would return to growth in 2014, but in August she backtracked on that plan, saying revenue growth next year looks unlikely. There was no change in that guidance today: The economy remains tough, and the company still has to improve its "go to market" strategy, Whitman said, or the way it prices and sells products. HP is taking several steps to get back on track, including the elimination of 29,000 jobs to cut costs. It has also said it will increase its spending on research and development, and it's doubling down on products like its Moonshot hyperscale servers, 3Par storage gear and Vertica analytics systems, all of which HP says have big growth potential. HP's R&D spending actually declined in the quarter just ended, but Lesjak implied that's because HP has cut its investments in Itanium and Unix products, both of which have shrinking markets. R&D spending will increase overall next year, she said. The company is also cutting more jobs than it originally planned. The number could reach 34,000 by the end of this fiscal year, which ends next October, Lesjak said. That's about 10 percent of HP's worldwide workforce, and it will look for further headcount reductions next year, though Lesjak said most of the "low-hanging fruit" is gone. The results Tuesday may give customers and investors some hope. HP also announced that it will pay out a regular cash dividend of $14.52 per share on the company's stock, the first of its 2014 fiscal year.